Essex and part of Suffolk. It is possible that the Trinovantes were one of only two British tribes knew of Caesar's intentions to cross the channel to Britain and so sent out ambassadors to the Romans in Gaul in an attempt to ensure they would be well treated should the Roman army invade and take over Britain. Mandubracius was the exiled king of the Trinobantes. His father (name unknown) had been killed by Cassivellaunus, and the Trinovantian prince forced to flee to the continent and the protection of Caesar. Shortly after the Atrebates tribe were taken into his protection, Caesar defeated the army of Cassivellaunus near Wheathamstead. Seeing all was lost, their ruler, Cassivellaunus surrendered, trusting to the mercy of Caesar. Julius Caesar never returned to Britain, and the Romans did not come again in force until the invasion of 43AD. But the fear he had instilled into the Catuvellauni assured the Trinovantes there would be no trouble from their neighbours. When the Roman general Varus lost three legions in the German Teutoberger forest in AD9, it inspired Cunobelin of the Catuvellauni took the opportunity to attack and capture the Trinovantian capital Camulodonum. The situation in Germania was serious, and Cunobelin had chosen his moment with care. 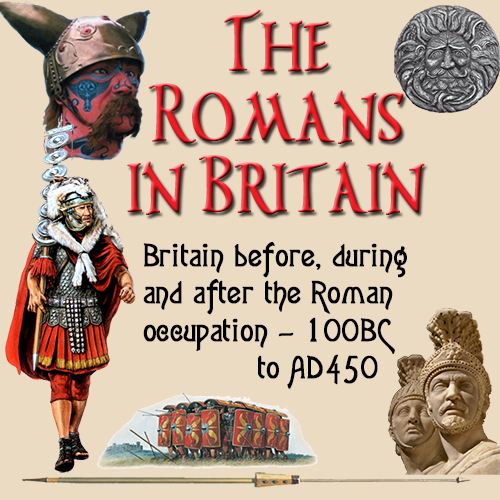 The Romans were now heavily committed to defending their borders in Europe, so Britain was put on hold. In 60AD, the Iceni under Queen Boudicca rose up in defiance of their Roman masters and began the rebellion that was to change Britain under the Romans. It is probable that the reasons for their joining the revolt was that because the Romans had not kept their word and forced the Catuvellauni back to their own territory. Also, they had not had their tribal lands returned to them after the defeat of Caratacus and the Catuvellauni. Coupled with the fact the Romans were taking vast amounts of land from in and around Camulodonum to build a Colonia for retired Roman soldiers, the Trinovantes were understandably sympathetic to the Iceni cause. Caesaromagus - (Widford, nr. Chelmsford, Essex) The Roman Civitas capital of the Trinovantes. Camulodonum - (Colchester, Essex) - The original capital of the Trinovantes which was taken from they by the Catuvellauni in 9AD. Camulodonum was the site of the first Roman Legionary Fortress in Britain, and was later to become the first Roman colonia colonia in the province. It was this colonisation by the Romans that was a major contributing factor to the Boudiccan rebellion of 60AD..
Canonium - (Rivenhall, Essex) - Settlement. Combretovium - (Baylham House, nr. Coddenham, Suffolk) - A minor settlement at an important road junction. Long Melford (Suffolk) - Minor settlement and posting station. Scole (Norfolk) - Posting station and minor settlement on the road north between Camulodunum and Venta Icenorum..
Sitomagus - (Dunwich, Suffolk) - Settlement, now below sea level. Stoke Ash (Suffolk) - Posting station on the road north between Camulodunum and Venta Icenorum. Mandubracius Was regarded by Caesar as the most powerful of the British tribal monarchs. Little is known about him. His possible sucessor, Addedomaros who started his rule around 15BC,may have been his son or grandson, There are no recordings of this. Indeed, it is possible that Mandubracius was the last of his line. If he did not have any children of his own, it would explain why the kingship of the Trinovantes passed to the Addedomaros family. There appears to have been a power struggle in the Trinovantes higher order for the right to rule, with the Addedomaros being victorious. The Catuvellaunian king Tasciovanus later claimed the thone of the Trinovantes and the two tribes became opposing sides in a war won by the Trinovantes, which enabled the Addedomaros to hold the throne. Addedomaros Was the known ruler of the Trinovantes to follow Mandubracius. Almost immediately after his took the throne, some time between 25 and 15BC, he moved his capital from Braughing ner Hertford to a new site on the east coast which he named Camulodunum which means 'the fort of the war god Camulos'. .It is possible that the Trinovantes were taken over by the Catuvellauni as the coins of the period from about 15BC, had strong markings indicating Catuvellauni influences. He reigned for about ten years before being succeeded by his son Dubnovellaunus around 10-5BC. Dubnovellaunus Succeeded Addedomaros to the Trinovantian throne about 10-5BC and ruled for several years before being overthrown by the Catuvellauni under the leadership of Cunobelin. He should not be confused with Dubnovellaunus of the Cantium.